Now is the time to prevent bankruptcy. Like a good chess player, you should be thinking about your financial moves several turns in advance. Thinking about how to avoid bankruptcy while the bill collectors are at your front door is the wrong time to plan your escape. Bankruptcy will force frugality on you if you do not accept living within your means before it is truly needed. 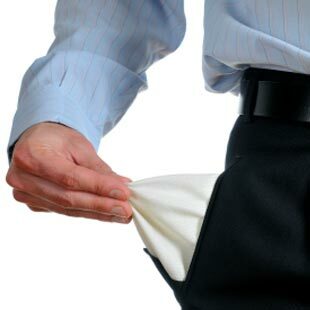 If you file bankruptcy, your spending will be limited thanks to your lack of available new credit. However, bankruptcy can be avoided if you start focusing on managing your money with more foresight before you are in trouble. Set Up a Budget. Many people want to set up a budget or budget their monthly expenses, but the whole process seems daunting for many people. However, tracking what you spend down to the very last penny every month can also make you more cognizant of how to more wisely spend and save your money. A budget is a necessity if you want to reduce debt, prevent financial ruin, and increase your savings and emergency fund. One great tool is to automate your budget and your bills every month. Use technology to your advantage. Budgeting makes you aware of where your money is going so you can organize your finances more consistently. Most people who fall into bankruptcy situations do not look before they leap with respect to their spending. Avoid situations that encourage impulse purchases and stick to your budget so you can continue to increase your emergency fund and investments, and reduce your debt. Send New Credit To The Trash. I was blown away the other day when my bank sent me a letter that I was preapproved for a $5,000 signature loan with no collateral. I am a little flattered that they think that I am a great credit risk, but I do not want to make my great financial situation worse by attaching my signature to yet another offer for credit. The best thing that you can do with new offers for credit cards and loans is the throw them away as soon as you get them. Call the bank and tell them to stop sending them too! They are a horrible temptation that no one needs in times like these especially if you are trying to clean up your financial situation. Any offers you receive for credit should be immediately relegated to the nearest trash can. Pay Credit Cards Off Each Month. The old adage is still true to this day. If you cannot pay cash for a small purchase that you have not saved up for, then you do not need it and quite possibly cannot afford it. Better yet, cut up all your credit cards except for one low-interest card with a low balance. Use it only for emergencies. My wife and I only use our American Express charge card that forces us to pay it off every month. Charge cards do not allow you to rollover any balances from month to month. House Poor And Car Poor. It is best not to sink most of your paycheck into your house payments or the payments that you make on your car. For example, Dave Ramsey recommends only purchasing a home on a 15 year mortgage that where the payments would equal a fourth of your take home pay. That is a tall order. There are many rules of thumbs like these to keep your major purchases under check. Make Sure You Are Covered. Adequate insurance is a necessity to avoid bankruptcy. Most bankruptcies in America come after a major financial hardship such as a divorce, unexpected death in the family, or medical expense. You should reevaluate your need for health, homeowners, renters, liability, disability, and other insurances. There is a huge undue financial burden that can result from not having adequate insurance coverage. It is better to set aside the money for premium coverage each month than face having to spend thousands of dollars in the event of an emergency. Bankruptcies do not just hit people out of the blue. They creep up on people one credit card or bad car loan at a time. But, there are several ways that you can protect yourself from bankruptcy.